I ask because I care. Or…yeah. But seriously, I have a friend here in DC who we jokingly refer to as a Jonas brother, because, well, he looks like one. Really and truly. Endless jokes about his next tour, where he’ll be playing tonight, etc. abound. And being a good guy, he takes it all with a smile. What really endeared me to Jonas (as he shall be called for the sake of this blog) is that the first night I met him, he ate my cookies like they were going out of style. Wait, let’s start that story over. Some friends of friends were picking me up for church. I didn’t know them, and they didn’t know me. 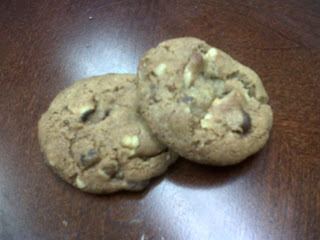 I brought some fresh-baked cookies to make life more interesting (okay, okay, I did it to make them like me! Geez. Can’t get away with anything around here). The Brown Sugar Almond ones, to be exact. So I climb into a car full of strange boys, pass over a Ziploc bag of cookies, and Jonas starts demolishing them like we’re in a professional food eating competition. I’m not even joking. He ate like ten on the way to church. And then some more on the way home. After that he sat down at my table and ate dinner. Obviously he knows what’s good for him. I mean, it’s really gratifying when someone likes your work, no matter what it is. When it’s something like cookies, I just want to feed you more. So I’ve been making big batches of my favorite recipes and sending them out into the wild. The other night my roommate witnessed him leaving with a bag of cookies and asked, “How do you always go home with dessert? !” He just laughed, but I know the truth. It’s me. I’m an enabler. Preheat oven to 350˚F. Mix all ingredients except chocolate chips and cereal/nuts. After dough forms, add final ingredients and blend well. Form dough into one inch balls, and place two inches apart on cookie sheets. Bake for twelve to fifteen minutes, or until light brown. If you want to keep these cookies more than a couple of days, I suggest either freezing them, or adding half of a piece of bread to whatever airtight container you are using for storage (the bread will keep the cookies moist). Those look sooo yummy! And he ate ten cookies on the way to church? 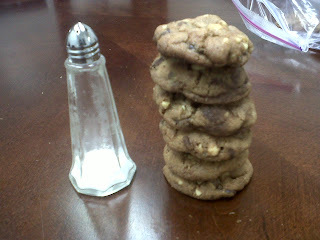 That's a lot of cookies, lol. No to the Jonas brothers, but the cookies look really, really good. and yes, i'd bake cookies for anyone, truthfully! is Jonas now wooing you? it didn't take him long to figure out that you are the bizzomb. Why is everyone talking about cookies today? Now I really, really want some, but no chocolate in the house. Wow--I would never have thought of putting dry cereal into cookies--they don't get soggy? Cecelia, I sometimes just can not read your food posts because they just look incredibly good and I'm jealous that I do not have any! I *wish* I knew you in real life. These look delicious. If I knew how my oven worked (or even where it is) I would so be making these for myself. These cookies must taste good cold, as proven by Jonas. So are they? I can only eat choc chip cookies warm out of the oven. I like cookies...I even know how to make the batter and warm the oven. Dang! I wish I wasn't so 'lazy'!